Many citizens with disabilities have difficulty parking on their street at locations convenient to their home. This is particularly true in neighborhoods with many cars parked along the street. The city allows people with disabilities to make a special request for a disabled parking spot on their street. Obviously, if every citizen made this request, there would be no room for anyone to park on the street. Thus, there are certain guidelines for approving these requests, and each is considered case-by-case. 1. The applicant must own a vehicle that is properly licensed and tagged, or be a legitimate dependent of a person owning a vehicle that is properly licensed and tagged. 2. Applicant must have no other vehicular access available to the home (ie. driveway, rear alley, etc.). 3. Applicant must be willing to make a curb cut and install a ramp at their own expense. The ramp must extend from the street to the sidewalk or entryway of the home. A permit would be required for this work. 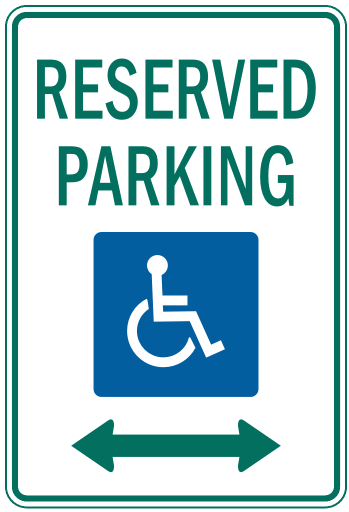 There is no need to install the ramp before making your disabled parking request; however, if the request is approved, the ramp must be installed before the city will erect a disabled parking sign. 4. The vehicle cannot remain in the proposed parking space more than 48 hours without being moved (this mirrors regular on-street parking requirements). 5. On-street disabled parking spaces are limited to two (2) per block; no more than one (1) on each side of the street within that block. 6. Requests are granted for a two-year period. If your need continues beyond two (2) years, the city is happy to renew it. We simply wish to avoid situations where the applicant later moves from the neighborhood, but the disabled parking signs remain forever, though no longer needed. 7. The city may require medical documentation for the disability. 8. On-street disabled parking, even in front of your own home, may be used by any other disabled person at any time. We hope others would recognize and respect the intent of a disabled parking space right in-front of someone's home, but it may legally be used by other disabled persons, as needed. 9. The Traffic Committee can make exceptions to the limitation on the number of disabled parking signs per block. The limitation exists to prevent excessive consumption of street parking spaces for individual people. However, the city does recognize the importance, convenience, and safety necessary to accomodate disabled persons, and will make exceptions for legitimate causes. Please contact the Street Department at 573-221-0111 ext. 216 if you wish to make such a request.